One year of GST: Has it reduced your bills? July 01, 2018: The Goods and Services Tax (GST) will complete one year in operation on June 30. It had been rolled out with high expectations that the new indirect tax regime would bring down tax burden on the ultimate consumers. 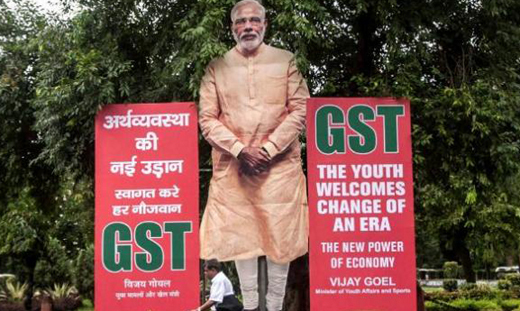 Prime Minister Narendra Modi had hailed GST as "Good and Simple Tax" that would achieve economic integration of the country following ’One Nation, One Tax’ principle. It is time now to ask these questions: Has GST brought down your household bills? Are you paying less while eating out, travelling or buying medicines after GST was rolled out on July 1 last year? According to an online survey conducted by citizen engagement platform LocalCircles, consumers saw limited benefits coming their way in the first year of GST. Majority of over 32,000 participants from 215 districts of the country, expressed that the GST regime required better enforcement. Only 21 per cent of the respondents said that their monthly household grocery bill reduced after the GST rollout. Another 63 per cent said that their household expenditure has not come down due to GST. Same is the case with people’s response to the question about their restaurant bills. The GST rate for restaurants was 18 per cent when the GST was first rolled out in July. It was reduced to five per cent in November. But 57 per cent of the respondents said that their bills while eating out had not reduced. Only 28 per cent said that they were paying less bills at restaurant due to GST rollout. The GST regime has a unique feature of passing on the benefit of input tax credit to the consumers. This is the key to have less tax burden on the final consumer. However, 61 per cent of the consumers participating in the online survey stated that the businesses were not passing on the benefit of the input tax credit under the GST regime. Only 15 per cent believed that the businesses are honestly transferring the benefit to the consumers. The six-layered GST has been seen by the respondents as cumbersome and confusing. Over 78 per cent of the participants in the survey favoured doing away with at least half of the slabs. About 40 per cent respondents said that GST should be a three-rate structure while 19 per cent favoured two-tiered tax rates and another 19 per cent called for single-rate GST. Responding to another question in the survey, 54 per cent consumers said that they were paying more for mobile phone, movie tickets and similar services after the GST rollout. While 14 per cent said the bills have reduced, another 19 per cent said the GST made no difference in their bills. The businesses expressed their own problems in the survey saying that it was tough to adapt to GST early on due to confusing rules like requiring a registration in all the states they operate in and filing of three returns every month. But on the same issue, the consumers said that many businesses increased the base price of the products on which the GST rate had reduced to keep the same MRP (maximum retail price) as before. The LocalCircles said that these complaints were being shared with National Anti-Profiteering Authority.